First, a quick reminder that The Witches' Stones is free on Amazon, Apr 24-26, 2015. And, now to the content rich blog :). LibreOffice, the office productivity tools, especially Writer. Calibre, the ebook producer and reader. With these four, you can write a book, make a cover, test out an ebook and upload to Amazon or other retailers. They don’t cost any money, though it is a good idea to send a donation every now and then. Smaller Scale. Think of the size of the organization that produces Microsoft Word versus the organization that produces LibreOffice Writer. I don’t know the numbers, but it seems safe to say that Word probably has 10 programmers for every 1 that Writer has – it might actually be a lot more than that. Does all that extra talent add proportionate value? Perhaps in some areas, but in others it may well subtract value by making the product excessively complex and over-featured. Compare this to publishing. A large publisher might have a dozen people involved in the production of a book, even an ebook (the writer, agents, acquisition people, editors, cover art people, marketers, legal staff, technical IT people, etc.). A well done Indie novel, on the other hand, can be produced by a few people, sometimes only one, if that person has the set of skills needed (writing, editing, cover design, a bit of technical smarts). Does the extra talent that the big publishing house puts into the product add proportionate value? Let’s just say opinions vary and the evidence is not decisive either way. Independence. Open source projects are, well, open. Almost any talented programmer can contribute to the project, if the contribution meets the expected standards. Obviously, to be involved in a big corporate programming effort, you first have to be hired on, so there is a high level of gatekeeping there. Again, compare this to publishing. Indie writer/publishers are, well, independent. They decide what they want to write, collaborate as necessary and give their work to the world, with no promise of reward. Traditional publishing, on the other hand, is heavily gatekeepered. You have to have a submission accepted, or the book will never see the light of day. Remuneration. Open source programmers often do it for the love of the project, though money can be involved. If the project really hits big, it might be taken private. Also, a good programmer can hone his or her skills on the project, and use that as leverage to be hired by a big corporation. Indie publishing is a matter of love and money. Most Indie writers love the activity so much that they are willing to take on a project with no guarantee of reward. But, an Indie book can hit big, and the writer gets to keep a large cut of the profits. And that success can be parlayed into a Trad contract, if the writers so desires. Protection of a Legacy Model. Open source software doesn’t have a lot of stake in protecting a product. It is constantly honed, hopefully improved. There is no legacy to defend. Big corporate software is all about ensuring that the product keeps spinning money for the company. Much of the effort goes into ensuring that users get locked into the product, and stay locked in. From a technological point of view, that can actually delay and inhibit progress. Indie publishing also has little stake in defending a legacy. Sure, we want to protect our copyright, but few of us have any cultural products to defend for decades, the way a big publisher does. We seldom worry that one of our books will “cannibalize” the market for simalr books that we have written. So, Indie writing and publishing goes to any new niche it thinks it sees developing, rather than trying to shut off interest in that niche. Overhead. Open source software development has low overhead. Most of the people involved contribute directly to the product. Big corporate programming, on the other hand, has many layers of handsomely paid management to take care of, as well as a lot of other peripheral personnel. Plus, there are often shareholders to keep happy. That’s just the nature of the beast. Corporate publishing is similar. There are many layers of management, real estate, non-creative employees, etc. Indies are lean – most of the money goes to the writer (if there is any ). I am sure that one could think of many other points of similarity – other people will have other lists. But that will do for now. 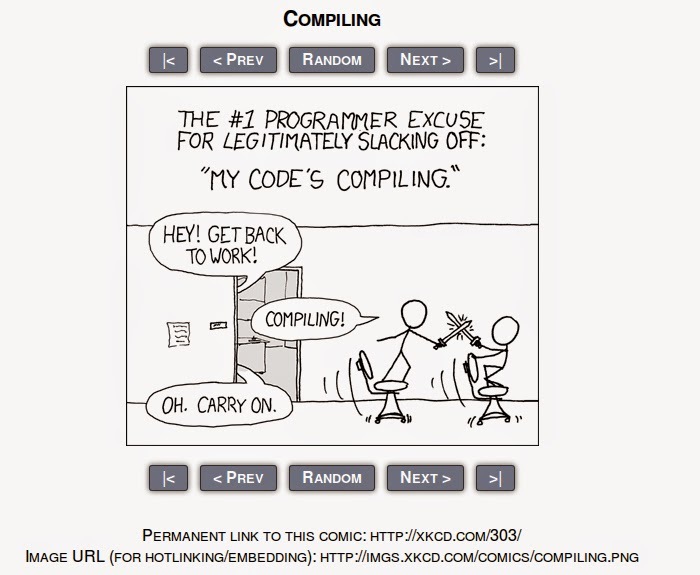 And here is an XKCD comic about programming: Open Source or corporate? Your call – maybe both.